It's hard to find someone in New Orleans to teach modern folks the ins and outs of Voodoo. The practitioners might have learned their lesson after the exploits of Bob from New Jersey in 2007. He kind of went crazy. He had more than fifty Voodoo dolls lining his room, one for every single person who crossed him on a day-to-day basis. He made a stuffed figure of his boss because he was denied a Christmas bonus. His neighbor probably should have trimmed that tree before a branch landed on Bob's car during a storm. He even had a mailman made of twine to punish his mail carrier for bringing his bills. We don't think that's fair but Bob wasn't necessarily a logical guy! We can blame folks like Bob for making it so hard to find a Voodoo doctor. This just goes to show that you've got to be careful how you express that Voodoo power. If you are ready to step into the world of potions and curses, you'll look like you're right at home in this bone-rich hat! Looking for the perfect way to top off your voodoo look? You'll love this wretched hat. 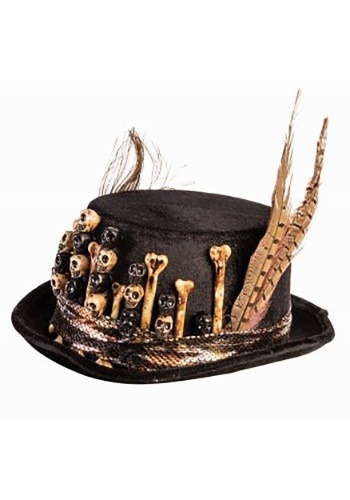 The brim is wrapped in a snakeskin fabric and has both feathers and bones arranged on the side. This hat is the perfect blend of old-school jazzy and witchy, looking right at home in a spooky Bayou atmosphere. It's a great way to finish off any warlock or witch doctor look. Simply throw it on and maybe that Voodoo knowledge will come to you on its own!